Diamonds are known worldwide as symbols of fidelity, love, and strength. Those lucky enough to be born in the spring also know that diamonds are the April birthstone. As a birthstone, diamonds are symbolic of courage, and were thought to protect the wearer from the evil eye. They were also sometimes given to fragile children, in the belief that the diamond’s strength would protect them from harm. Giving a diamond today has a significantly different meaning. Usually, diamonds are given as engagement or pre-engagement gifts, or for marking special occasions, such as anniversaries. Diamonds are the traditional gift for the 60th anniversary, usually given as a ring. A small diamond chip ring may be given as a birthday gift to a young girl as the birthstone of April, but a diamond heart necklace is a more appropriate gift. Necklaces do not need to be sized, and may be worn for a lifetime without being out-grown. Diamond necklaces also do not carry the romantic symbolism associated with diamond rings, making them an acceptable gift for a male relative or friend to give to a woman of any age. 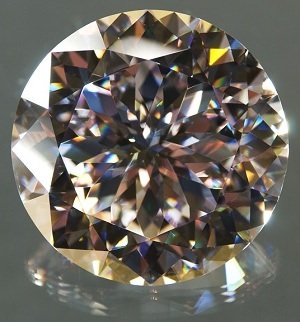 Diamonds are generally set in gold, silver, or other precious metals and some very unique settings can be found, or custom designed if desired. Diamonds set with other gemstones are a popular alternative to traditional settings, with the gemstone itself carved into a heart or other shape. Classic settings are a safe choice for gift giving however, since they never go out of style. Many people are looking for a birthstone alternative to the diamond, mostly because they are expensive. Though some people opt for a different gemstone due to the ethical issues that surround diamonds. A great alternative is the blue sapphire, this is one of the two traditional birthstone for April, the other being the diamond. Blue sapphires are an affordable and beautiful alternative and one that can be worn daily, just like diamonds. When choosing a diamond for a gift, several factors need to be considered. Your budget will determine the carat weight and setting type you can afford, of course, but you should also consider the recipient’s age, activities, and personality. A large diamond heart may be fine for a woman who likes attention-getting jewelry, while a small pendant may get lost on a non-petite woman. Very young children and active teens may break delicate settings or fine link chains. Choose your gift based on how you expect it to be worn, as well; if you expect a child to wear her diamond necklace only on special occasions, a delicate setting may be fine. Those who are likely to wear it every day should be given a necklace designed for heavier wear. Giving the birthstone of April of any form should always be treated as a special event. If this is to be a girl’s first diamond, take the time to make sure it is presented well, attractively packaged, and hopefully given in a meaningful manner. A girl should never forget her first diamond, so anything you do to make her gift more special will be remembered for the rest of her life.